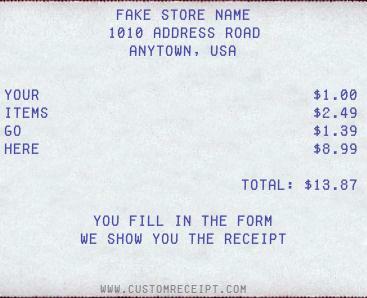 This tool lets you make your own custom receipts. Customize your receipt below and press the "Make the receipt!" button. Your custom receipt will be shown (containing the text that you entered) in the space above. The completed receipts are in dollars only but you can enter non-dollar amounts for prices if you like. That way, you can say that something is "free" or "cheap" or whatever you like. What should you put in your custom receipt? It's up to you! The top of he receipt might give a store with a funny name, or perhaps a strange address. Put things you'd like to get, or give products crazy prices. Make a serious receipt, but put a funny slogan at the bottom! Be creative. The only limit is your imagination. Our latest creation! Make your own custom prescription. Make a funny custom eye chart. If you liked the custom receipt generator, try making a custom road sign! Make a custom wedding sign! - Put your message on the wedding chapel sign!